According to a publicity campaign launched on behalf of a paper authored by UNLV (University of Nevada, Las Vegas) Professor Frank Cucinotta, the new findings show “collateral damage from cosmic rays increases cancer risks for Mars astronauts“. However, an examination of the paper itself shows no analysis of experimental methods or results, because no experiments were done and no data was taken. Rather, the much-ballyhooed paper is a discussion of a computer model that Prof. Cucinotta has created which claims to have the power to predict radiation-induced cancer occurrences. In short, there’s no real news. Furthermore, to the extent that the model in question has any empirical foundation, it is based on irrelevant prior experiments done in which researchers subjected mice to radiation dose rates millions of times greater than astronauts would receive on their way to Mars. One such example is the illustrative piece of nonsense entitled “What happens to your brain on the way to Mars“, published on May 2, 2015, in the open-access journal Science Advances. In the paper, a group of radiation researchers claimed that their recent experiment causing memory loss to mice by administering very large doses of galactic cosmic ray (GCR)-like high energy radiation has serious implications for human Mars exploration. According to the authors, similar effects might severely impact astronauts going to Mars, thereby placing the feasibility of such enterprises in serious question. However, in this typical mouse trial, the victims were given a dose of 30 rads (0.3 Gray) at a rate of 100 rads per minute. On a Mars mission, astronauts would receive a dose of 1 rad per month during the 6-month outbound and return transfers as well as about 0.5 rad per month during 18 months on Mars, for a total of 21 Rads. (1 Gray = 100 rads = 100 cGray. For GCR 1 Gray = 6 Sieverts = 600 rem.) Space dose rates can be found in The Cosmic Ray Radiation Dose in Interplanetary Space – Present Day and Worst-Case Evaluations by R.A. Mewaldt, et al., 2005. The 4-million fold difference in dose rate between such lab studies and spaceflight is of critical importance. It is a well-known finding of both chemical and radiation toxicology that the effects of large doses of toxins delivered suddenly are entirely different from the effect of the same amount of toxin delivered in very small amounts over a long time span. The difference is that the body’s self-repair systems cannot deal with a sudden dose that they can easily manage if received over an extended period. For example, if an individual were to drink one shot of vodka per second for 100 seconds, he would die; however, if the same person drank one shot of vodka a month for 100 months, he would experience no ill effects at all. This is about the same ratio of dose rates as that which separates the invalid work reported in the What happens to your brain on the way to Mars paper (1.6 rad per second) from that which would be experienced by astronauts in space (1 rad per month). It should also be added that mouse studies are not an accurate predictor of cancer occurrence in humans; e.g., it is possible to induce tumors in mice by rubbing their stomachs. Such treatment is not known to be a hazard to people. It is true that small amounts of toxins received over a long period can statistically increase a person’s risk of ill effects – at least according to the hyper-conservative Linear-No-Threshold (LNT) model of toxicology. However, we already have data that shows that the accumulation of slow rates of cosmic-ray radiation received during long-duration spaceflight is not a show stopper for human Mars exploration. GCR dose rates in low-Earth orbit are about half those in interplanetary space. Therefore, there are a dozen cosmonauts and astronauts – Padalka, Malenchenko, Avdeyev, Polyakov, Solovyov, Krikalyov, Titov, Manarov, Foale, Fincke, Pettit, Walz, Kelly, Whitson – who have already received Mars mission equivalent GCR doses during extended space missions without any radiological casualties. Furthermore, since the International Space Station (ISS) is continually manned, whereas Mars missions are only in space for about 40 percent of their mission time, the total GCR dose (measured in person-rems) that the ISS program crews will receive over the next ten years of planned operations is about the same as would be received by a series of five teams of five people each if they were launched to Mars every other year over the same period. Thus, in fact, the ISS program has already accepted the same level of GCR risk for its crews as would be faced by an ongoing human Mars exploration program. Galactic cosmic radiation is not a show stopper for human Mars exploration and should not be used as an excuse for delay. The space program costs many billions of dollars, which is spent at a real cost to meeting human needs elsewhere. That fact imposes a moral obligation on the program to move forward as quickly and efficiently as possible. It is understandable that radiation researchers should want to justify their funding. However, they should not spread misinformation to promote themselves at such extraordinary expense to the public. Dr. Robert Zubrin is the founder and President of the Mars Society, an international organization dedicated to furthering the human exploration and settlement of the planet Mars by both public and private means. He is also President of of Pioneer Astronautics, an aerospace R&D company located in Lakewood, Colorado. Formerly a Staff Engineer at Lockheed Martin Astronautics in Denver, he holds a Masters degree in Aeronautics and Astronautics and a Ph.D. in Nuclear Engineering from the University of Washington. I wonder if these galactic brain rays can explain one or two things that are happening in the news media nowadays. Rays from Outer Space, sounds like a 1950s sci fi title with crazy cows and all. Many things in astrophysics are so fantastic that one couldn’t make it up. But this brain ray thing is made up. It’s an old myth of ghosts that keeps returning. Classic case of self-aggrandizing careerist academic research … expensive trite. Zubrin is Martianese for Huckster. So many mistakes. Mice don’t get stomach cancer. The experiments were published earlier and cited Ref. 14 etc. Zubrin is totally clueless on dose-rate. At the low doses studied in experiments there is only one or zero heavy ion in each cell. So dose-rate plays no role. Etc etc Zubrin is the huckster or no understanding of physics. No, it isn’t Zubrin who is “clueless.” He’s simply using the available published data to reach the conclusions that any competent scientist would reach. The study referenced is a computer modeling paper, and really lacks any substance at all. It’s all about dosage rates, versus healing and regeneration of healthy tissues. Radiation shielding, when needed, doesn’t need any new physics. Just launch more mass. We (well, rocket scientists) know how to do that. And they are cutting the cost per mass by an order of magnitude or so per decade now, at least. $.1 billion for a launching 50 tons of shielding mass isn’t the end of the world, is it? This “problem” doesn’t really exist. Just an attempt by another academic trying to both make a name for himself through publication of a meaningless paper. Too much wasted paper on computer modeling studies, based on irrelevant data. Was this even in a peer evaluated publication? If the pioneering astronaut crews on Mars construct underground shelters, the planetary surface GCR exposure can me moderated and attenuated through thickness of regolith overburden. I’s actually possible through reduced above ground exposure to hours of daylight, to reduce daily exposure by 40%. Above should state “Peer reviewed” publication. 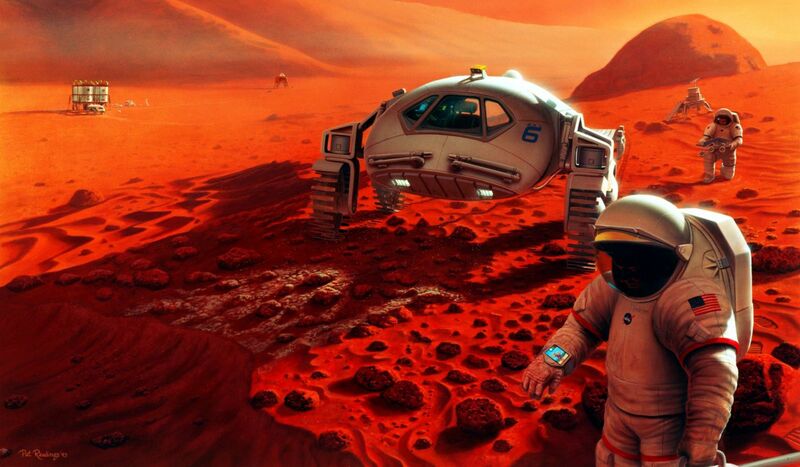 All those willing to go on a trip to mars, regardless of the radiation risks, raise your hand. I’ve got both my hands raised.